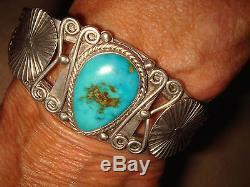 Presenting an early,'Old Pawn', Sterling Silver, and Turquoise, cuff/bracelet. 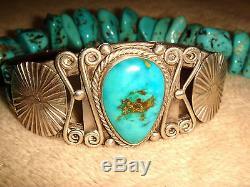 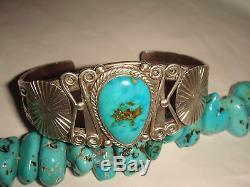 From the Fred Harvey Era, this handsome cuff features a gorgeous pear shaped, natural Turquoise stone. 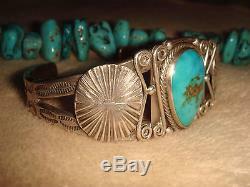 The stone is bezel set, with a braided frame, scroll work, stamping, and creative applied round Concho sides. 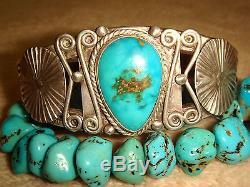 The cuff measures approximately just over 5 1/2" from the underneath side, with an added opening gap of 1", X just short of 1 1/8 at the center widest. 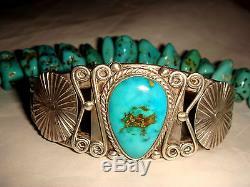 Weight is 30.6 grams. 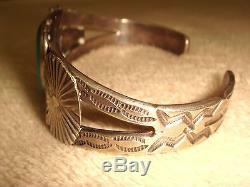 The cuff is hand engraved the letters OBA makers initials, see pix. 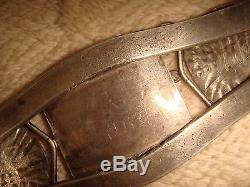 It is unmarked like many early Native American pieces, but guarenteed to test Sterling. 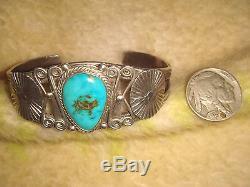 The cuff has been kept clean with a soft cloth, and has a darkened, aged patina on the underside. 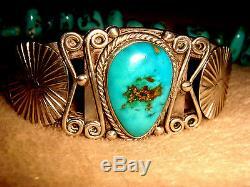 A beautifully designed cuff, appropriate for men, or women. 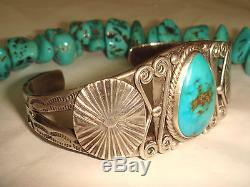 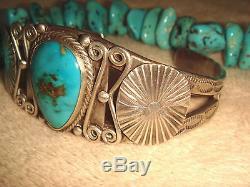 The item "VTG FRED HARVEY ERA OLD PAWN NAVAJO STERLING SILVER TURQUOISE CUFF BRACELET OBA" is in sale since Thursday, July 27, 2017.